It is evident that in recent years, Belize has seen the advent of the business process outsourcing (BPO) industry with the boom of contact call centers providing services to various offshore companies. The first center opened its doors in 2005 and today, there are over 16 active BPO centers in Belize employing well over 2,000 agents while offering both inbound customer service and outbound sales services. The industry has also been recognized as a specialized “niche” area and priority sector for employment generation and Belize’s socio-economic development by the Government of Belize (GOB). It also enabled the development of a comprehensive business process outsourcing (BPO) strategy completed by global outsourcing consultancy firm AVASANT in 2013. Though the interest in Belize’s BPO industry proceeds with robust growth, there is a shifting focus where multinationals seek to outsource even higher value added services to Latin America and the Caribbean. 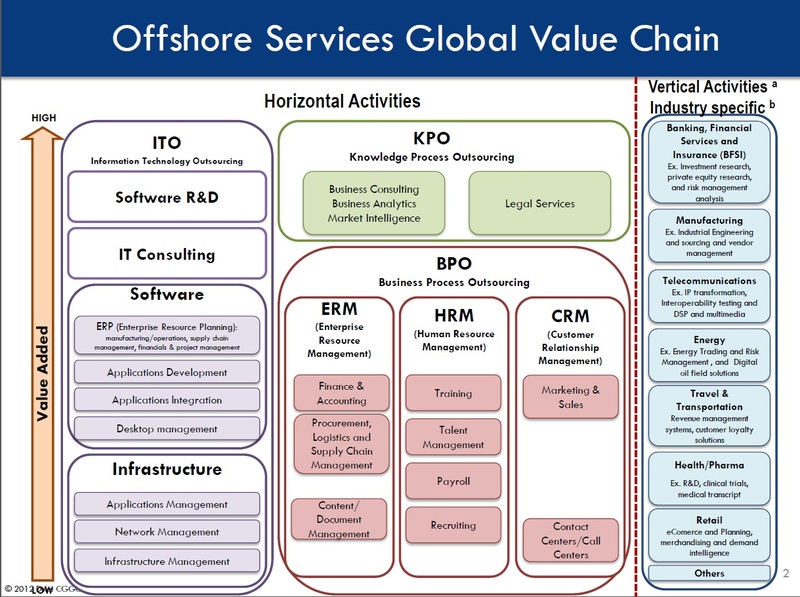 Two (2) of these primary areas of outsourcing service diversification include information technology outsourcing (ITO) and knowledge process outsourcing (KPO), both of which can create a new “niche” for the export of services from Belize through offshore outsourcing. The reasons for this shift are myriad including the opportunity to tap into lower costing, English speaking, near shore markets due to rising costs in Asia. It also enables organizations to leverage a new and innovative talent pool offering the same agility and access to new markets as popular destinations like India and the Philippines. A recent publication by the HfS index 2013 shows that the outsourcing market was valued at USD 648 billion being spent in ITO and KPO services while only USD 304 billion was spent on BPO services. That said, Latin America and the Caribbean is being looked at closely to fulfill this growing demand of higher value added services and Belize also remains on the radar. The next step would then be to identify the “niche” areas ensuring competitiveness in both price and quality of these services while building credibility and trust in our available Belizean talent. Business process outsourcing (BPO) involves the contracting of the operations and responsibilities of specific business functions (or processes) within an organization’s value chain to a third-party service provider. Currently, Belize is primarily hosting contracts in the areas of contact call centers, marketing & sales and finance & accounting. As the diagram above indicates, there are still ample opportunities that exist for BPO’s in the areas of enterprise resource management (ERM) and human resource management (HRM). This diversification would then create additional employment opportunities apart from the typical call center agents at the High School or Associate’s level. These opportunities involve the areas of: accounting, financial management, data transcription, human resource management and training, amongst others. The BPO value chain also enables internal growth from being preliminary agents, to supervisors, to even quality assurance managers, trainers and team leaders. According to KPMG, knowledge process outsourcing (KPO) enables companies to expand their growth by outsourcing their core business processes to providers who have highly skilled and specialized professionals at a competitive cost. The key difference between KPO and BPO is that BPO focuses on standardized and routine processed to reduce fixed costs, whereas, KPO delivers services more at a strategic than an operational level as it offers experience in overall business more than in the process. According to experts from ConnectAmericas at the Inter-American Development Bank (IDB), this market has grown almost 20% in 2013 representing over 17 million dollars in Latin America and the Caribbean alone. Currently, there are a few firms that are engaged in upper tier KPO services though not formalized or expanded. This then presents the key area of opportunity for experienced Belizeans to seek employment via outsourcing conducting work under various projects and contracts globally. Employment opportunities in this field of outsourcing would be myriad including: business consulting, business intelligence and analytics, market intelligence, forecasting, legal services, engineering, market research and development (R&D), clinical research, amongst other popular knowledge areas being outsourced today. Information technology outsourcing (ITO) is often coined the middle ground between BPO and KPO as it is not only a routine technical process nor is it fully strategic but a blend of both in the realm of I.T. enabled services (ITES) and ICT Innovation. Essentially, it is simply the outsourcing of all or part of an I.T. function within an organization to 3rd party developers often taking a project based approach. 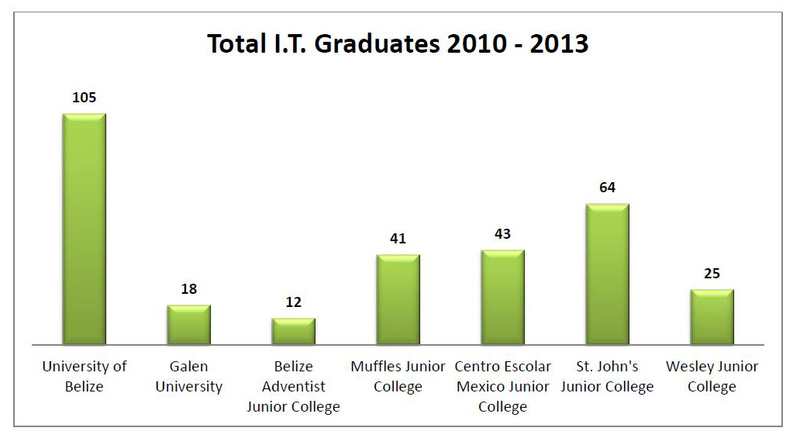 According to a recent study by BELTRAIDE, the University of Belize has churned up to 105 graduates in I.T. with 56 earning a Bachelor’s degree and 49 earning an Associate’s between 2010 and 2013. During this same period, the Junior Colleges in Belize that offer an I.T. Associate degree program have produced 185 graduates in I.T. with Galen University recently introducing its program being scheduled to graduate 18 in 2014. This means that in four (4) years, we have produced close to 308 programmers in Belize’s I.T. talent pool; however, many do not end up working in their related fields due to limited job opportunities available in I.T. This is where I.T. Outsourcing presents a new and vital opportunity to these passionate Belizean developers, enabling them to work virtually for large scale clients such as Dell, Intel or even Google, granted the right skillsets and organization into formal ITO firms. Internet and mobile penetration as well as competitive bandwidth rates remain at the forefront for these developments. The specific employment opportunities in this area would range from foundational I.T. technical support to more advanced and specialized services. Essentially, firms in Belize focused on I.T. outsourcing would provide employment opportunities to programmers, web designers, application developers and managers, network administrators as well as I.T. Consultants. Areas in which Belize can begin to provide services immediately would include: tech support, data management, search engine optimization (SEO), content management, mobile and web application development, digital marketing and business analysis. Future career paths would entail analytic modeling, cloud computing, “big data” management” amongst other large scale I.T. projects. In an effort to validate the niche of I.T. outsourcing (ITO) services that Belize can compete in, the Belize Trade and Investment Development Service (BELTRAIDE) in collaboration with the Ministry of Energy, Science & Technology and Public Utilities, the Belize Telemedia Limited (BTL) and the Belize Tourism Board (BTB) organized and launched, the Belize Hackathon 2014, a national competition bringing together the brightest minds in Information Technology at the tertiary level. On Friday 13th June, 2014 at 2:00pm registered teams of three (3) students from the University of Belize (UB), Galen University, Centro Escolar Mexico Junior College (CEMJC) and St. John’s College (SJC) were provided with a problem statement to develop a mobile application solution to a realistic problem in Belize. Thereafter, they have had an entire weekend to devise or “hack” a solution to the problem to be submitted by Sunday, June 15th, 2014 at 6:00 pm sharp. The nature of the problem that each team was required to solve over the weekend involved a mobile application on transport catering to tourists as well as local Belizeans. Essentially, the problem statement mentioned that when a tourist comes to Belize, they are often not familiar with the transport system and how to get around in Belize including the water taxi schedules, local flights, bus schedules, taxi rates, etc. The applications that the student teams came up with were beyond impressive as the audience members and panelists were awed by the ICT Innovation showcased at the Hackathon. 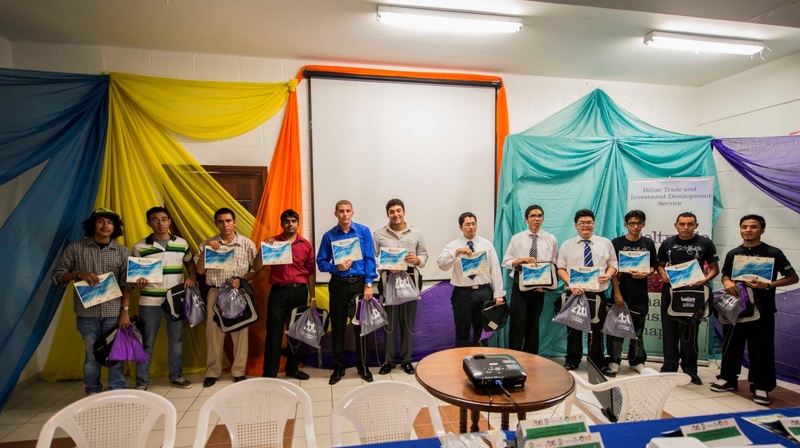 The Belize Hackathon 2014 has indeed proved that the current talent being graduated from the teritiary level institutions is able to compete and work under pressure to develop solutions to mitigate practical real world situations. This is a success story that will enable Belize’s I.T. and ICT sector to truly boom as it provides credibility to the innovation, creativity and technical skills that exist in Belize. It is our hope that the Belize Hackathon 2015 will be even larger and all-encompassing to continue the stimulation of ICT Innovation in Belize’s niche I.T. Outsourcing market. In conclusion, Belize is able to tap into numerous opportunities in the global offshore outsourcing market as we have a variety of talent available and produced annually. Belize is also able to leverage the near shore cost effective advantage and English speaking bilingual capabilities amongst numerous other competitive advantages. The Government of Belize through the Belize Trade and Investment Development Service (BELTRAIDE) is looking to continuously attract investments into the BPO, ITO and KPO service sectors to ensure that Belizeans are able to tap into various employment opportunities and career paths even at the international level of value added services in business processes, information technology and knowledge processes.